Had some Alan Partridge Toblerone moments this Easter! That’s what I get for staying off chocolate I guess. (PS my personal preference was cadburys egg with a pint of milk! )….If easily offended don’t watch this to the end! Hope you had a nice long weekend. 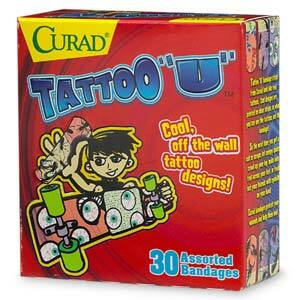 I love the story of how Curad, the smaller player in the bandage market took on Band-Aid, the market leader. The bandage maker has been smart in how it took on Band-Aid, I mean lets face it a plaster is a plaster. But when a kid has an ‘ouch’ moment sometimes getting a plaster on them can be a challenge….also you want that plaster to be the ‘make everything better’ moment.With J&J behind them you would think there would be no way that they could take them on and win. But when it came to children’s bandages, that is exactly what they did. Curad continued to cater to the ever-growing children’s market and in 1991, began to produce specially shaped bandages for fingers, elbows, knuckles, and knees. Then they really went after Band-Aid and in conjunction with several blockbuster movies and television programs, Curad had its bandage strips printed with such characters as Casper the Ghost, Jurassic Park dinosaurs, and Cartoon Network characters. Then in 1997 they launched a Design Your Own Bandage contest, in conjunction with Nickolodeon. The contest was so successful that it became an annual event.Not wanting to leave tweens and teens out, they launched Tattoo-U designs. In another clever move, in 1998, Curad teamed up with the American Youth Soccer Organization and became a sponsor of the AYSO, which in turn offered Curad bandages as the official team bandage. Of course kids dont actually buy the bandages so the marketing strategy was targeting the consumers who actually did the purchasing, married people between the ages of 35-54. Most of the mass marketing occurred where the kids usually shopped with their parents, not pharmacies, but supermarkets. Johnson & Johnson’s Band-Aid, Curad’s major competitor, didnt sit still of course. They fought back trying to go one better than Curad launching a range of plasters with Disney characters, endangered species (which was a tie-in with the World Wildlife Fund), and NASCAR racing designs. By the late 1980s, Curad had approximately 25 to 30 percent of the total market, while Johnson & Johnson had about 60 to 65 percent. In 1990, Curad’s sales increased about 20 percent, and Band-Aid’s sales dropped about 10 percent. By 1993, Curad held 36.1 percent of the entire children’s bandage market, while Johnson & Johnson held 26.6 percent of the children’s bandage market. 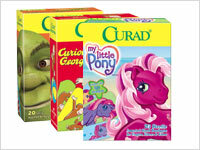 By the end of the 1990s, though Johnson & Johnson still had greater overall bandage sales, Curad continued to lead the children’s bandage market. Don’t just say there is a new Elephant, allow people be a part of it, have that feeling of a new arrival. Very well executed idea. I presented at the Fundraising Ireland conference recently about research I carried out with the DSPCA around Facebook and levels of engagement offline as a result of online activity. We found that people were more aware of animal rights issues and more likely to take offline action as a result of the organisations Facebook activity. You can look at my presentation here. asked survey respondents whether or not they felt they had attracted new constituents (donors, members, volunteers, clients, or event attendees) through their Facebook page. And people did indeed see successful results. The percentage of respondents who said they they’d seen “a few” or “substantial” new constituents of that type, who also said that attracting that type of constituent was important to them. People didn’t see as much success with new donors and volunteers, though…. Respondents reported the most success with using Facebook to direct new people to their websites, with more than 75% saying they’ve seen an increase in web traffic. With free web analytics tools like Google Analytics, tracking who followed your link from your Facebook page is one of the most measurable goals included in this survey. And more than 65% said that they’d had some success with moving people to take some form of action for a cause, like signing petitions or other advocacy actions. Online petitions and other political or advocacy actions are easy to do, demand little time, and are easily spread through Facebook and other social media. Following in suit from the constituent impact, donations saw little success; less than 30% saw success. Surprisingly, respondents didn’t have a huge amount of success with increasing their email lists via Facebook either only 42% saw results. Maybe people aren’t including links or widgets to allow their fans to sign up, or like one person mentioned, fans may prefer to be contacted through Facebook messages and updates, instead of through email. The percentage of respondents who said they they’d seen “some” or “substantial” effect that they would attribute to Facebook. The percentage of “Moved People to Take Action” and “Increased Donations” are out of those organization who said those actions were important to them, while “Increased Website Traffic” and “Increased Donation” are based on all respondents. I don’t know about you but I sometimes think about the Lottery of Life, how my life could have been different based on where I was born. Save the Children commissioned Swedish advertising agencies Lowe Brindfors and B-Reel to build “The Lottery of Life” in order to give users the opportunity to see where they might have otherwise been born. When you log on to the site the intro tells you about the lottery of life and then you can connect with facebook (or just add your name) and then spin the wheel. Using population stats you will find out where you could have been born and are then exposed to stats about that country, like illiteracy rates, child mortality, poverty. You can share your life ticket on Facebook, twitter and people can help you by donating or collecting more support through their own networks. Here is a short video about the campaign. You can check out the site here, worth taking the time. Eoin O’Brien tweeted this earlier in the week. Complexity – The available media offers have exploded. Alone on YouTube, 20 hours of video are uploaded every minute. The available number of television channels is, on average, in the hundreds. Information in a barely manageable volume is sent to sources at lightning-fast speeds. Context – With the flood of news on various channels, the user is left to evaluate and rank the context. Without the right context, there is the danger of misunderstanding information. Interactivity – At the moment, when people talk about TV interaction, they refer to the most basic interaction one has with one’s television set. To interact with a television program, one must still “call-in”, or the more “modern” equivalent: of “e-mail-in”. This has quite an oldfashioned taste in our days. The classic channel communication model is no longer valid in the online world. Interactivity is the key to modern television. Independence – GOAB should function independently from in and output devices. For these reasons, GOAB is intended to be completely cloud based. Regardless if accessing via laptop, tablet or smart phone, the personal preferences and network are always available. To watch television, the device triggers a display if available or directly plays back the content. Always an Optimal Experience – Through this independent behavior, the system is always delivering optimal transmission to the device of choice. Regardless if to a smart phone, living room beamer or a hotel room in another city. Integration of social media – The integration of social features is naturally a must. The potential in regards to user relevance is yet to be determined.